It’s hard to believe that our younger son has been living at his cottage on the edge of Sheffield with the Peak District and Ladybower Reservoir on his doorstep for three years already. His neighbour owns a holiday rental cottage in the same terrace and I finally managed a few nights stay there last weekend. The location has the best of both worlds – near to the vibrant and cultured city of Sheffield and yet just a short drive from the beautiful Derbyshire Dales/Peak District National Park. The outlook from the cottage is pastoral and peaceful. And there is perhaps too much choice when it comes to excursions to fill three full days. 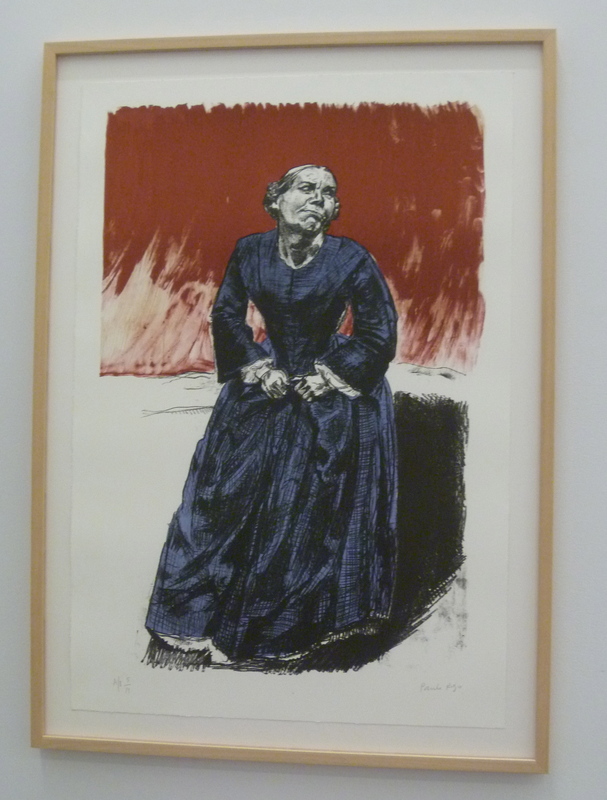 If you watched all of the video recording of The Brilliant Brontes in the last but one post you will have seen Sheila Hancock inspecting and discussing the drawings of Jane Eyre with the artist Dame Paula Rego. By coincidence a week later one of the most prominent museums (yes, there are several!) 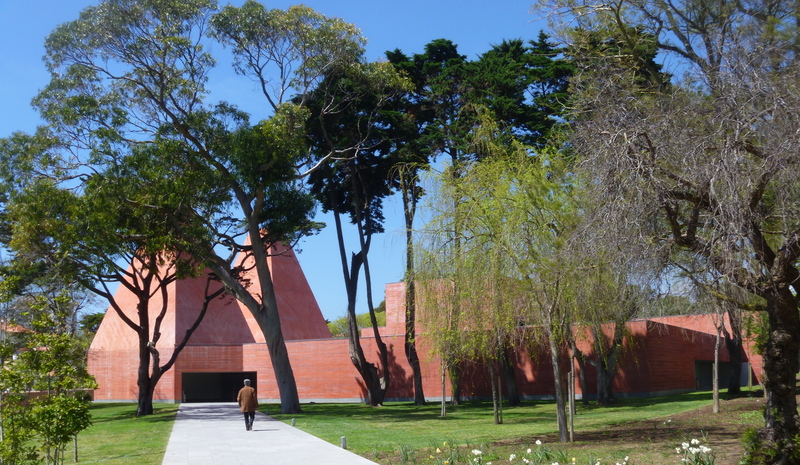 in Cascais turns out to be devoted to the work of Paula Rego (and it has a nice cafe too). Shortly after our arrival we decided to take a walk and investigate. Rego was born in Lisbon in 1935 to keen Anglophile parents who sent their daughter to an Anglican English language school in Lisbon and later to school near Sevenoaks and art school (The Slade) where she met her future husband Victor Willing. She became a naturalised British subject and was created a Dame of the British Empire in 2010. She divides her time between Britain and Portugal. 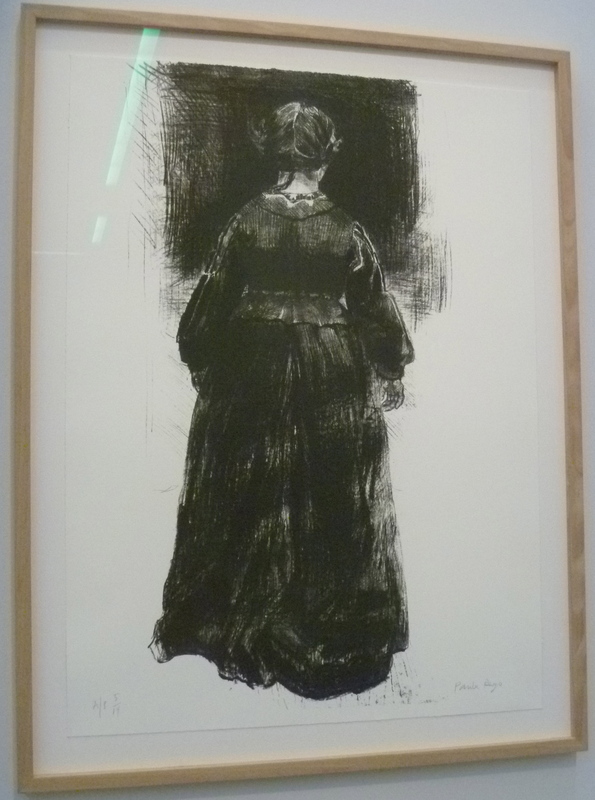 Here are some of her Jane Eyre works currently on display at the gallery Casa Das Historias in Cascais. 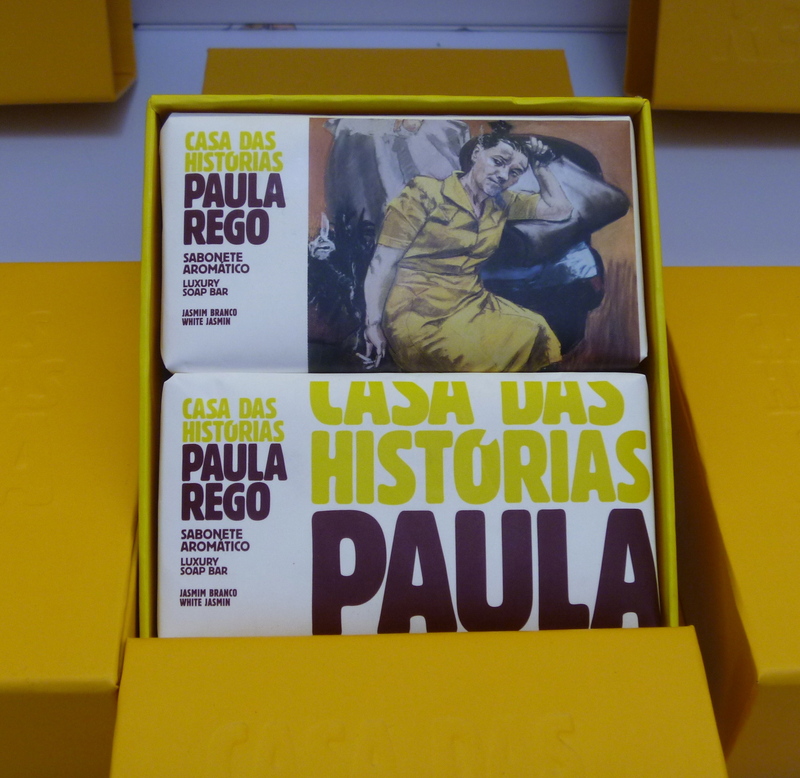 I had no room for the Paula Rego soaps in my luggage! 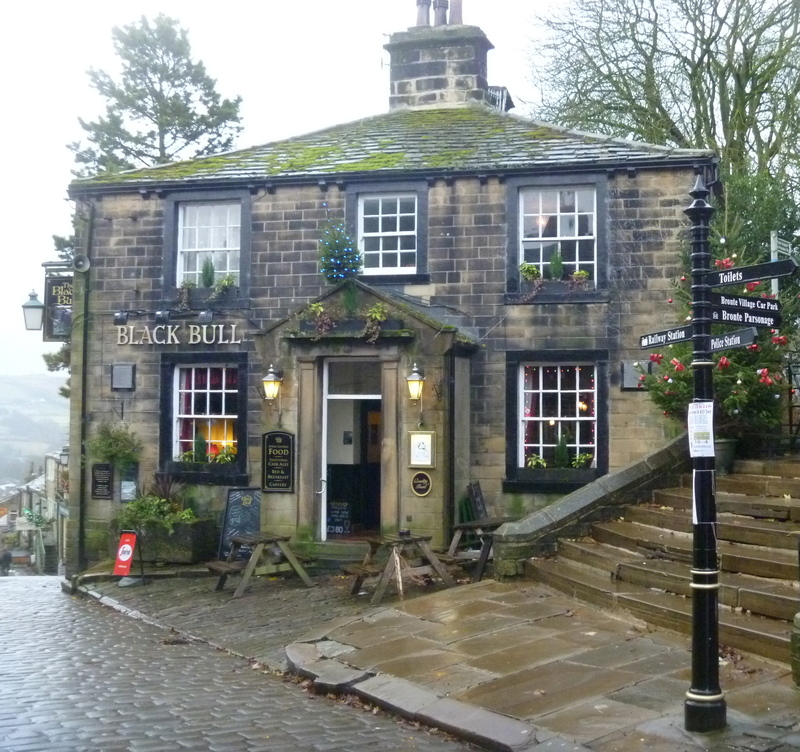 Sheila Hancock talks eloquently about the Brontë sisters and even visited Red House! 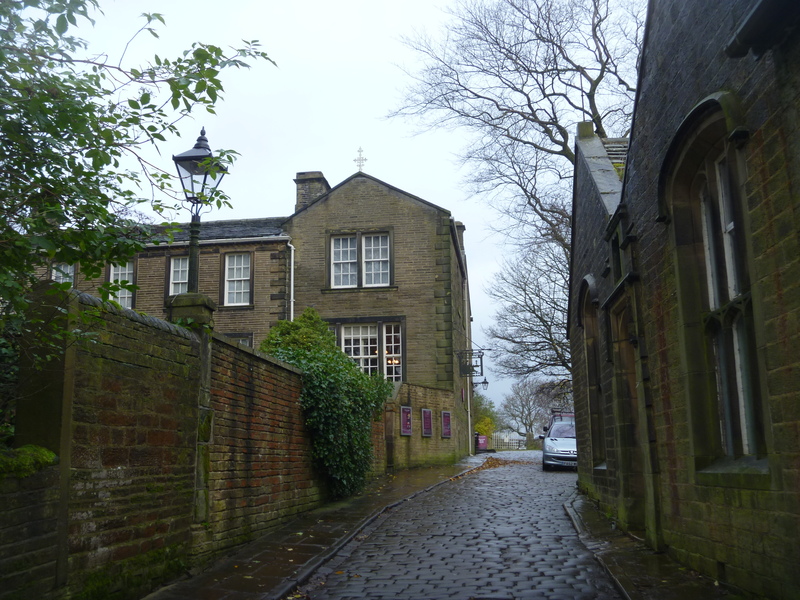 Back in December I visited Oakwell Hall in Birstall to look at the Christmas decorations and promised myself that I would follow up with a visit to the nearby Red House; which also has Brontë connections. In the ‘It’s Happening …’ leaflet which I picked up that day I noted a future exhibition to be mounted at Red House on the topic of its one-time inhabitant Mary Taylor. The exhibition runs from 2 March until 2 June. No photography is allowed inside the house; but never mind it’s a bit disappointing anyway. Several times in the 1980s I brought my sons here as they laid on some good children’s craft workshops (and still do). For quite a few years it was closed for renovations and yesterday was my first visit since then. 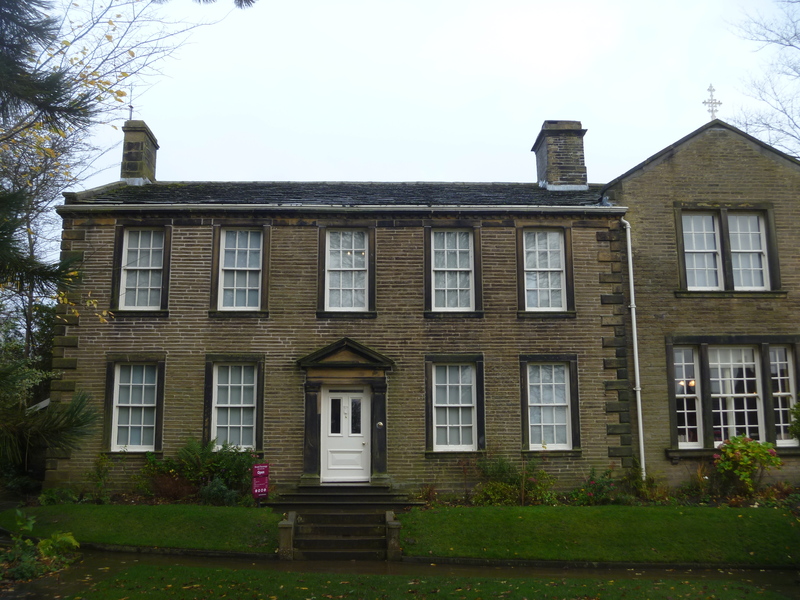 I was told that the house has been returned as nearly as possible to how it would have looked in the 1830s; the time when Charlotte Brontë visited. Some furniture, pictures and fittings are original, or of the period, and the rest have been carefully copied; for example the ‘Brussels’ weave, looped pile carpet in the Parlour, window curtains and bed hangings in the Main Bedroom and wallpapers. 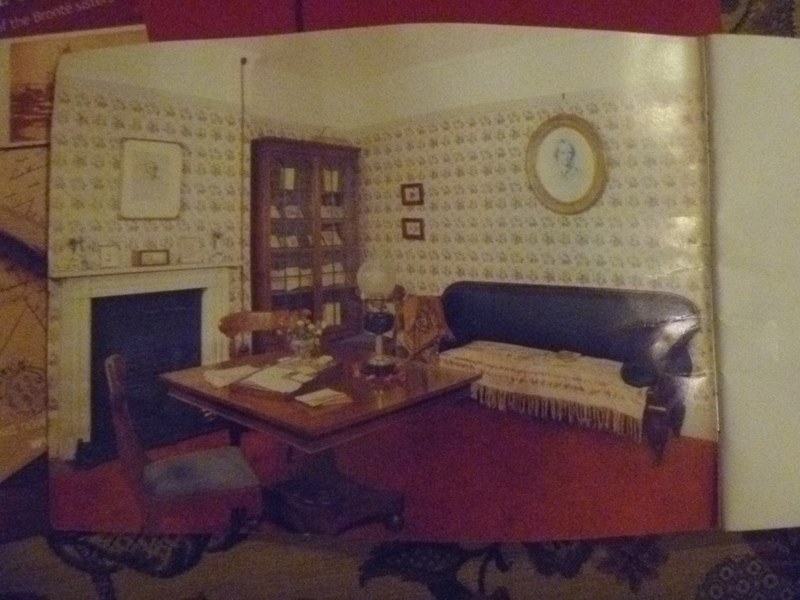 There are very few rooms to visit – The Parlour (left in photo) with waxworks of Mary Taylor (playing the piano) and her mother (stitching tapestry); the adjoining scullery and kitchen; across the hall (which serves as reception and shop) there is the dining room and a study (right in photo). 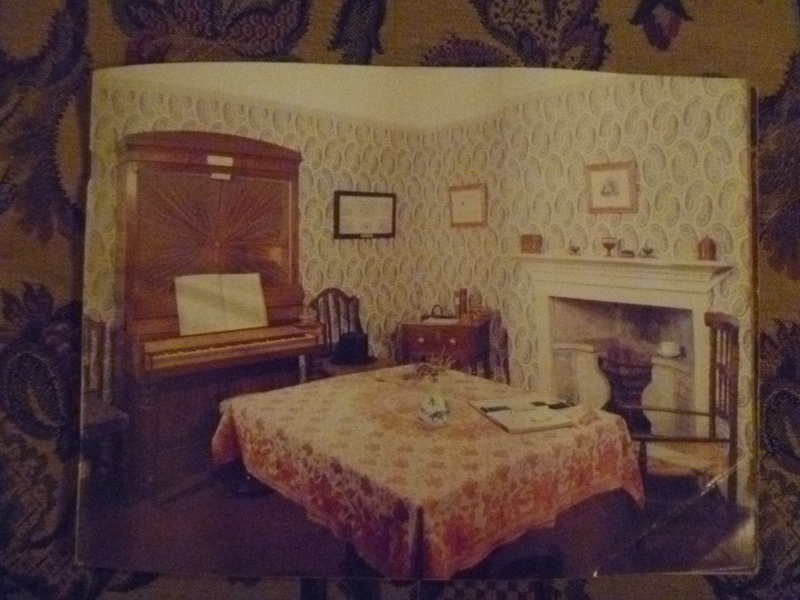 Upstairs you can visit the Main Bedchamber (above the parlour), the Governess’ room and the Girl’s room. The Taylors were a prosperous, middle class family and Joshua (a woollen cloth manufacturer and merchant) lived here with his wife Anne and their six children. 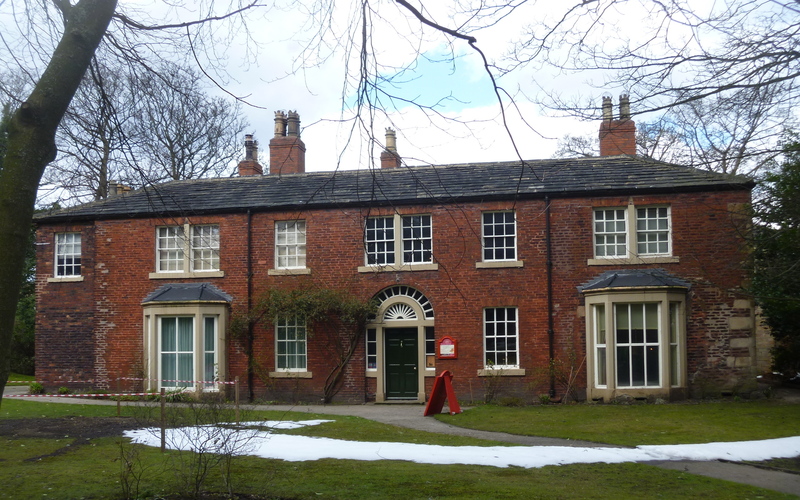 Their daughter Mary (1817-1893) was a great friend of Charlotte Bronte, who often visited Red House and featured the house as ‘Briarmains’ and the Taylor family as ‘The Yorkes’ in her novel ‘Shirley’. 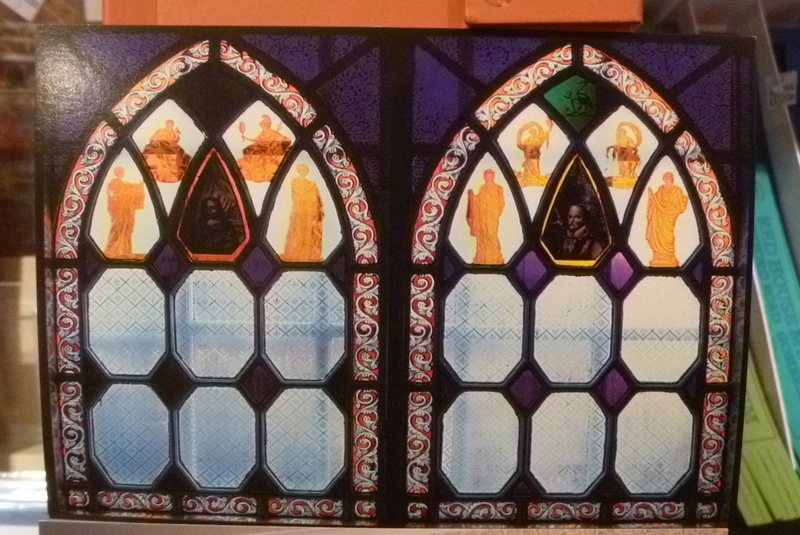 Perhaps the most interesting feature, to me, were the stained glass windows in the Dining Room with painted heads of William Shakespeare and John Milton. Charlotte Brontë describes in ‘Shirley‘. So, having almost galloped through the main house I spent quite some time in the Exhibition Gallery studying the fascinating life of this woman Mary Taylor. 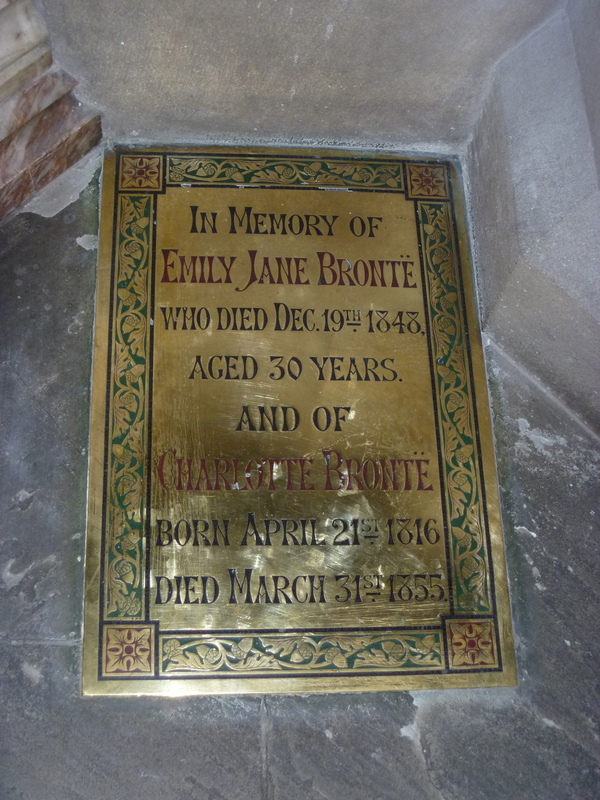 One hundred years after her death she is now gaining recognition through Charlotte Brontë’s descriptions, through her letters and through her own published works. Examples of her books were displayed (including modern reprints). She wrote “The First Duty of Women” and a novel “Miss Miles, or a tale of Yorkshire life 60 years ago”. She was a strong-minded woman intent on pursuing her own way of life and living by her own ideals. She was an early feminist and strongly believed in women having their own independence. She attended Roe Head School near Mirfield (where she met CB) and later The Chateau de Koekelberg in Brussels. She taught in Germany and I was surprised to read that in 1845 she emigrated to New Zealand and was one of its earliest settlers. There she owned a successful shop. 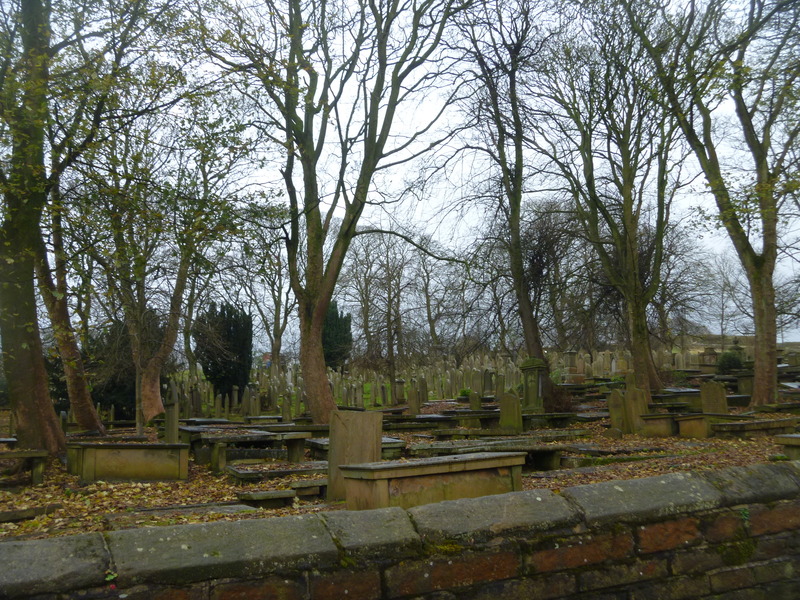 She returned to Britain in 1860 and spent the rest of her life in nearby Gomersal. That is, when she wasn’t being a woman after my own heart and leading women’s mountaineering holidays in Switzerland! “Swiss Notes by Five Ladies : an Account of Climbing and Touring in 1874″ was reprinted with a supplement by Peter A. Marshall and Jean K. Brown. I didn’t have time to investigate these but I will be definitely go back, so watch this space! We have had days and days of constant rain. The dark misty clouds mean that the days seem even shorter than the time of year supposes that they should be, so I decided to ‘step back in time’ to a nearby house with Bronte connections – Oakwell Hall in Gomersall. 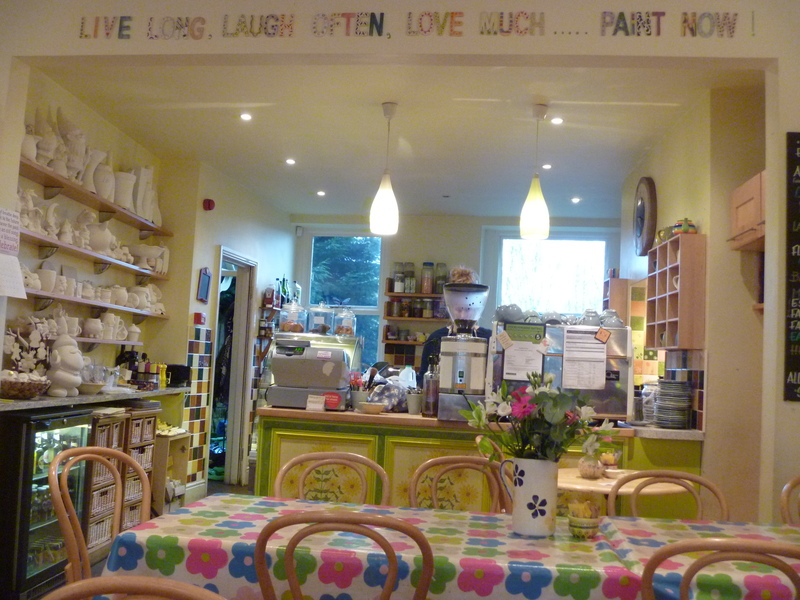 It is now owned by Kirklees Council but has had an interesting history and the lovely house dates back to the 16th century. Read about the fascinating study of the timbers, panelling, layout and construction of Oakwell Hall here. It is such a shame that photography is no longer allowed inside Oakwell Hall as the greenery and decorations brighten up the rooms at this time of year. 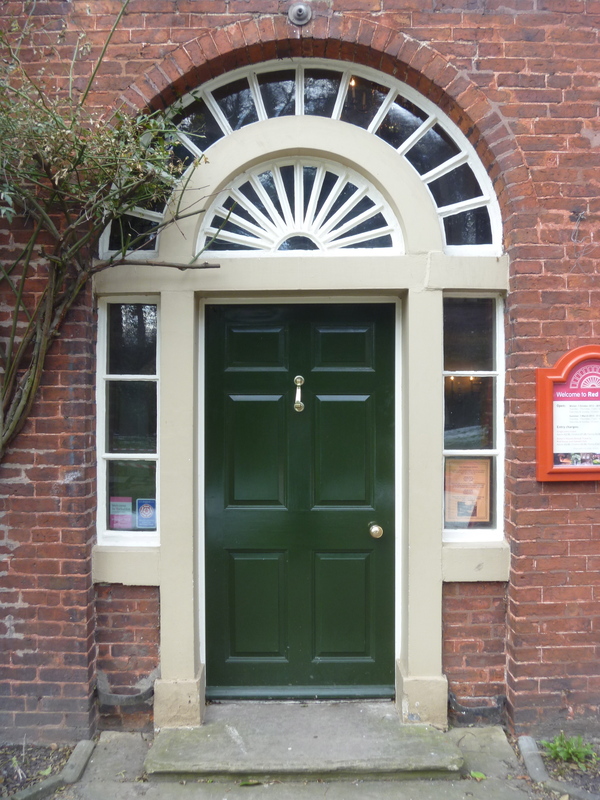 Thought to be built by one John Batt, whose initials appear above the door, Oakwell was occupied by him and his family for way over a century. Between 1789 and 1927 when the hall was bought by the local council it had several owners and was at times a private residence, at times occupied by short term tenants (families and schools) and at one point was threatened to be “taken down, brick by brick, and shipped to America”. 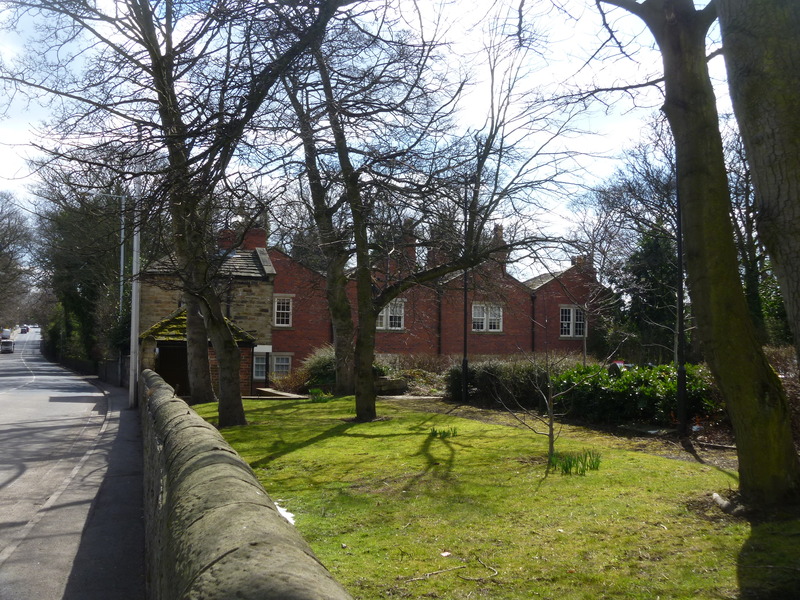 A local appeal was then launched and with the help of two particular wealthy benefactors (Sir Henry Norman Rae and John Earl Sharman) the house was saved and passed to Batley Corporation (now Kirklees Council). 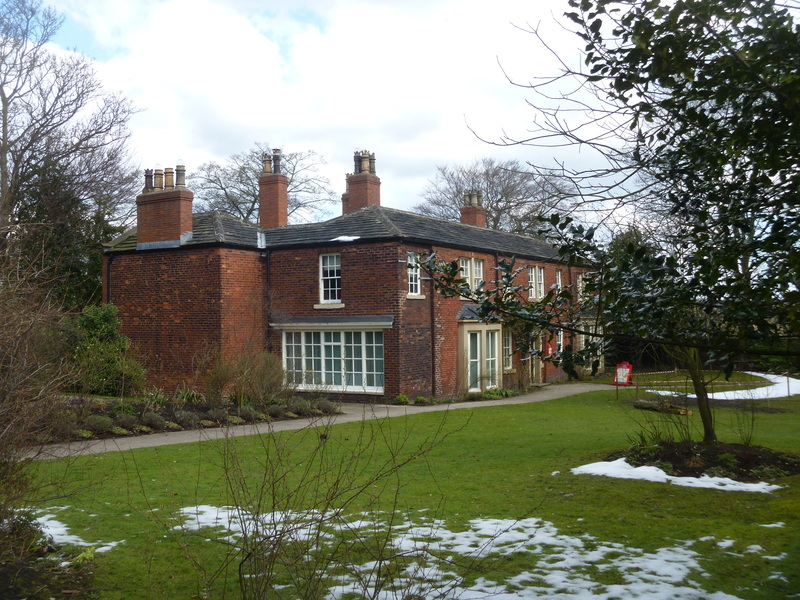 Since 1927 the house has been a museum and more recently the surrounding parkland has come into Council ownership and the whole is now Oakwell Hall Country Park. As you tour the house, after being greeted in the Great Hall, at one point on the ground floor you pass into the Buttery. 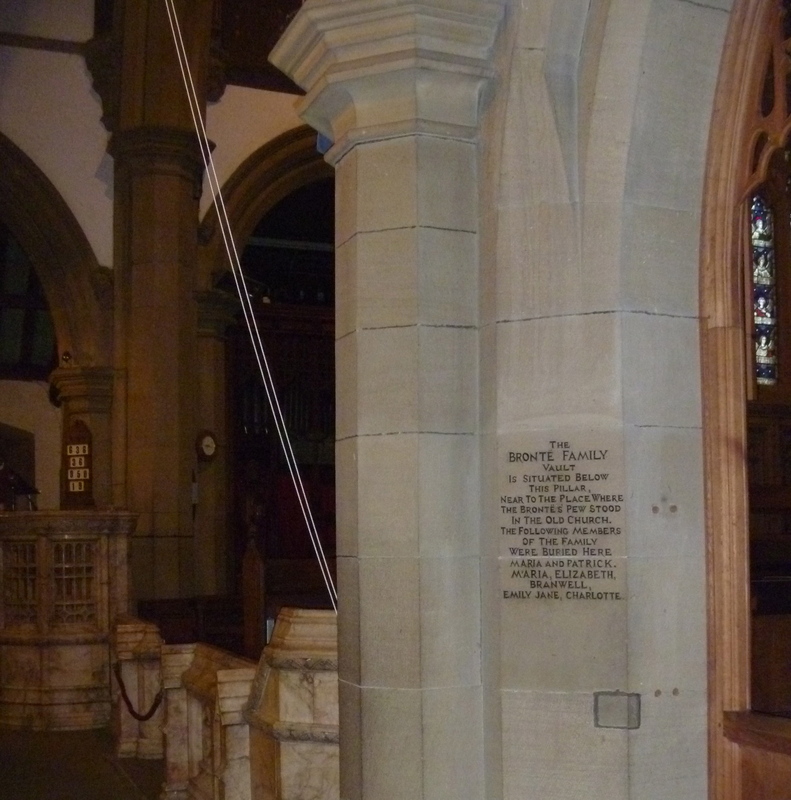 This bare room with stone floor is now a small information space and here I read more about the Bronte connection with Oakwell Hall. 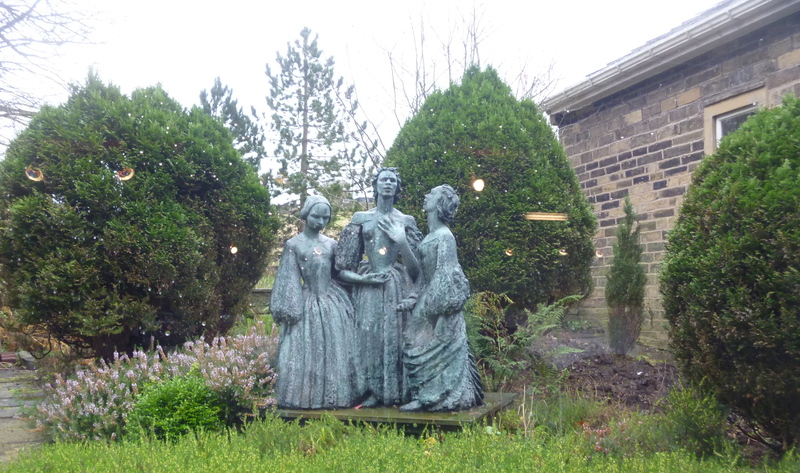 Whilst a pupil at Roehead School in Mirfield Charlotte Bronte made friends with Ellen Nussey and Mary Taylor. 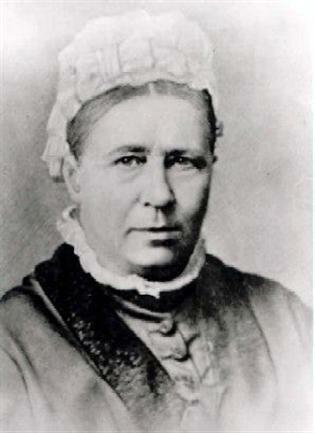 Ellen later attended a school at Oakwell Hall and CB frequently visited her here. 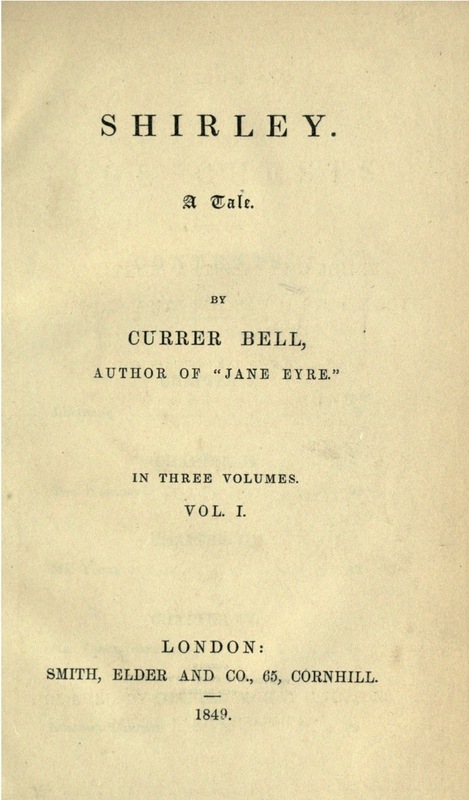 She was inspired to base her descriptions of the house Fieldhead on Oakwell Hall and she also based The Yorke family in the same book on her friends The Taylors. Accurate descriptions of the house interior and exterior can be lifted straight from Chapter 11 “Fieldhead” in Shirley. colouring communicated by time, gave it a just claim to this epithet. chimney-stacks, were rich in crayon touches and sepia lights and shades. oak: fine, dark, glossy panels compassed the walls gloomily and grandly. Talking with one of the Museum staff I also discovered that several filmings had taken place at Oakwell over the years. Notably in 1921 a silent film version of Shirley. A 2009 TV version of Wuthering Heights used Oakwell for its interior scenes. Fast forward to around 48 minutes in if you are only interested in seeing some interior shots of Oakwell. The exterior shots look to me as if they were filmed using East Riddlesden Hall near Keighley. The interior scenes of The Secret Diaries of Miss Anne Lister, also made for TV was filmed here at Oakwell. The true home of Miss Lister was nearby Shibden Hall at Halifax but I was told that the rooms at Oakwell were much larger to allow for all the cameramen’s paraphernalia. On leaving the cosiness of the hall you enter the lovely, beautifully ordered, Elizabethan gardens. I made a mental note to revisit these on a less wet and grey day. I hurried home to light my own Christmas tree lights and relax with a mince pie. Yesterday I revisited Haworth with a friend. 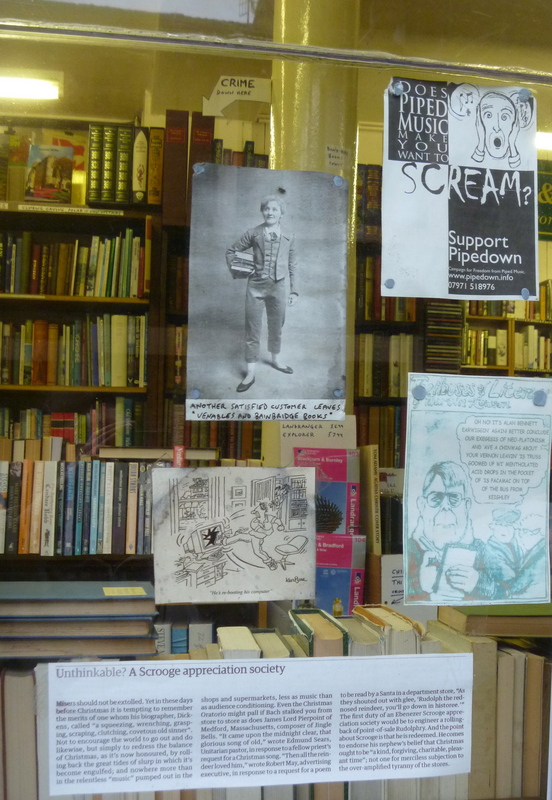 Looking back at my Flickr photos I see that my last visit to this Literary Shrine was in 2005. On that day, it was a Sunday, the queue to get into the Parsonage stretched down through the garden. I planned to return on a quieter day. So, a mere 7 years later, I was back again and indeed found the village and Parsonage very much quieter. 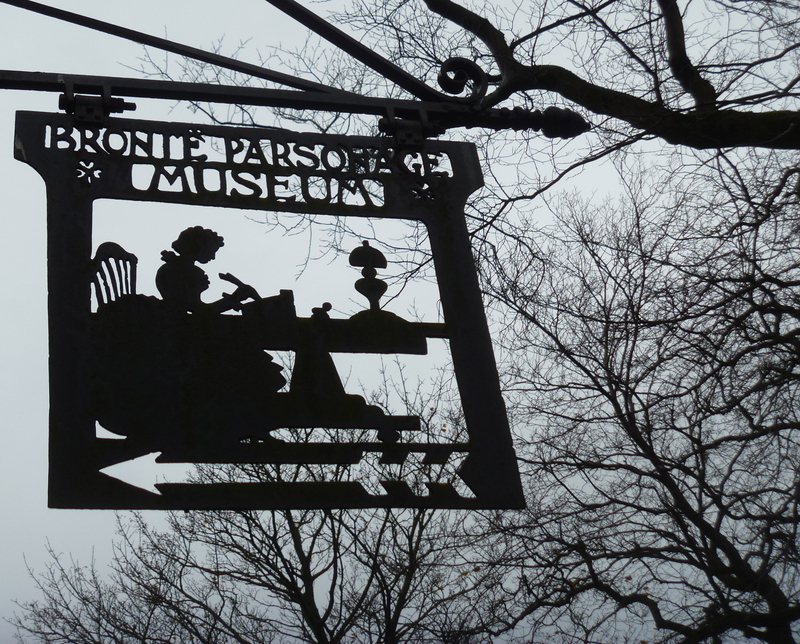 [Mental note to self – visit Haworth Parsonage on a Monday in November] My only previous visit inside the house itself was in the early 1990s. 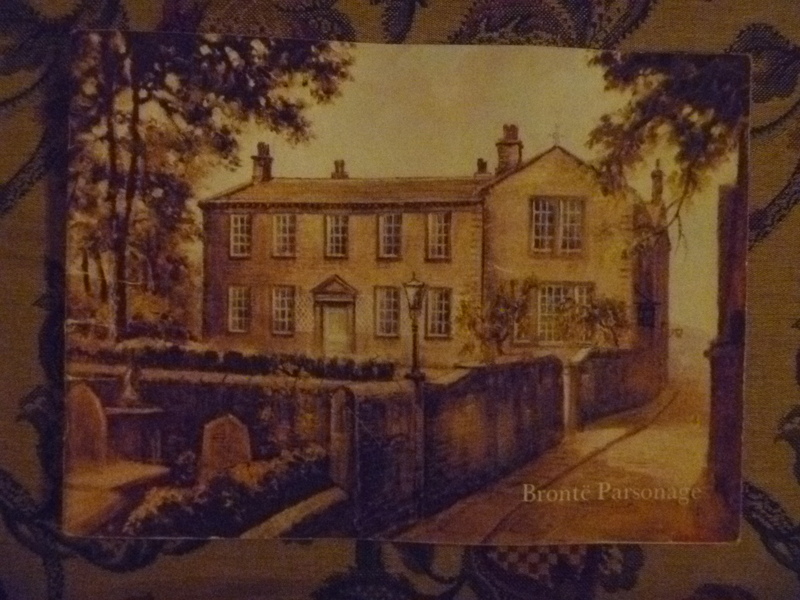 I’m sure I don’t need to explain here that the Parsonage at Haworth, near Keighley in West Yorkshire was home to the Bronte family (probably the world’s most famous literary family) from 1820 to 1861. 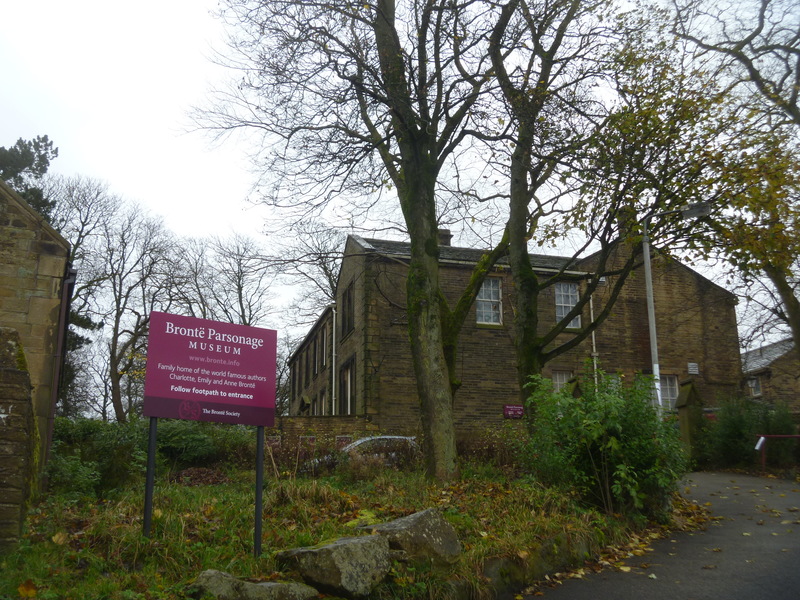 There’s a further exhibition called Bronte Relics : A Collection History. 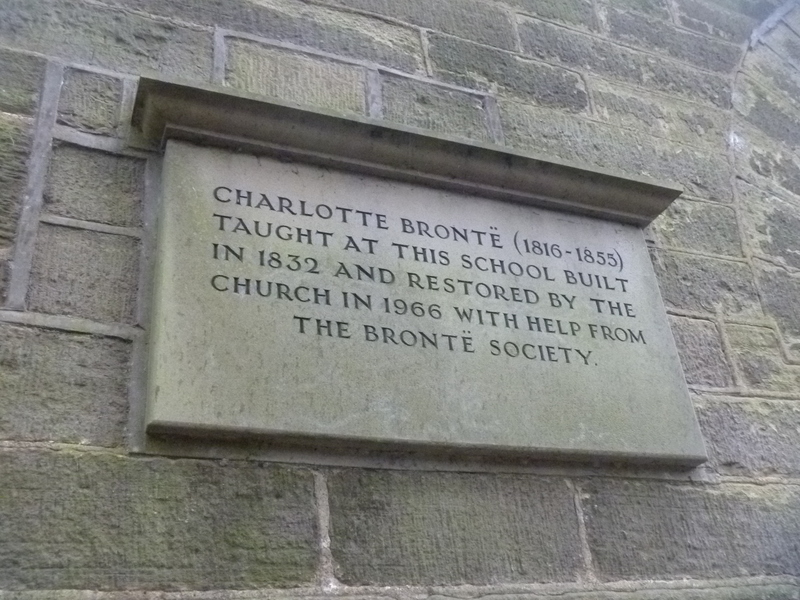 Opposite The Parsonage is the School in which Charlotte Bronte taught at one time. No visit to Haworth can be described without a mention of the weather. Maybe on occasion the sun shines up on Haworth Moor but I do believe that I have yet to experience this phenomenon! Today was cloudy and wet and typically atmospheric. But read here about a summertime visit. 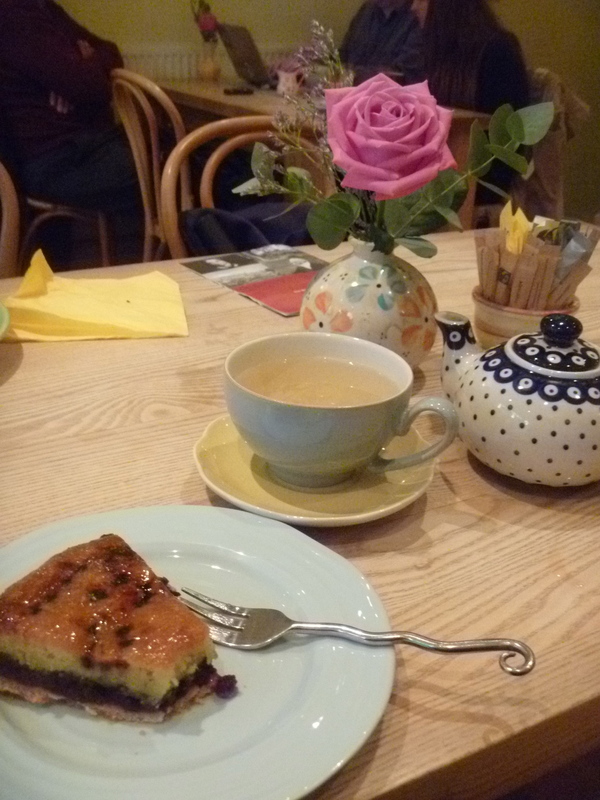 After just over an hour in the Museum we headed for a bright and jolly Haworth tea shop, stopping briefly to enquire whether the bookshop [Venables and Bainbridge] had any copies of Wuthering Heights in Polish for my friend to buy for her daughter-in-law. It didn’t. 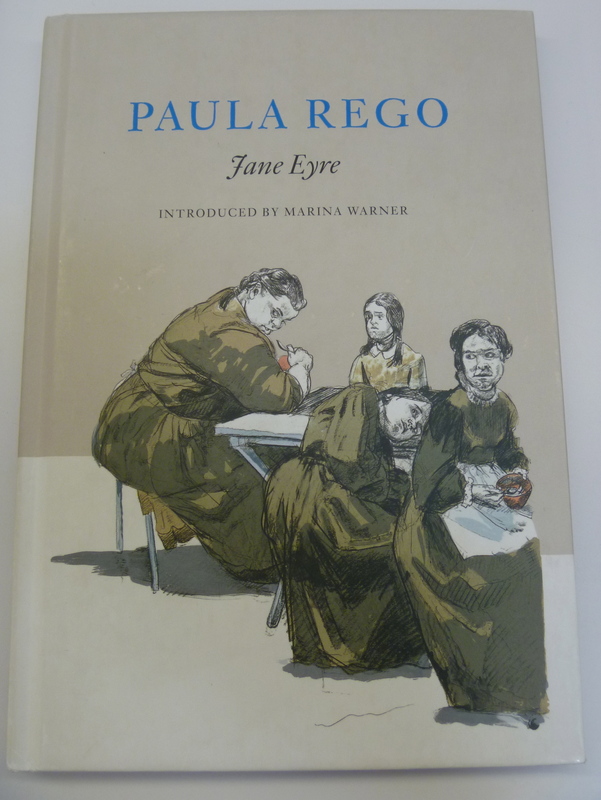 We were surprised that there were no foreign language versions of the great novels in the Bronte Museum Shop. We know they had sold French and German versions in the past. 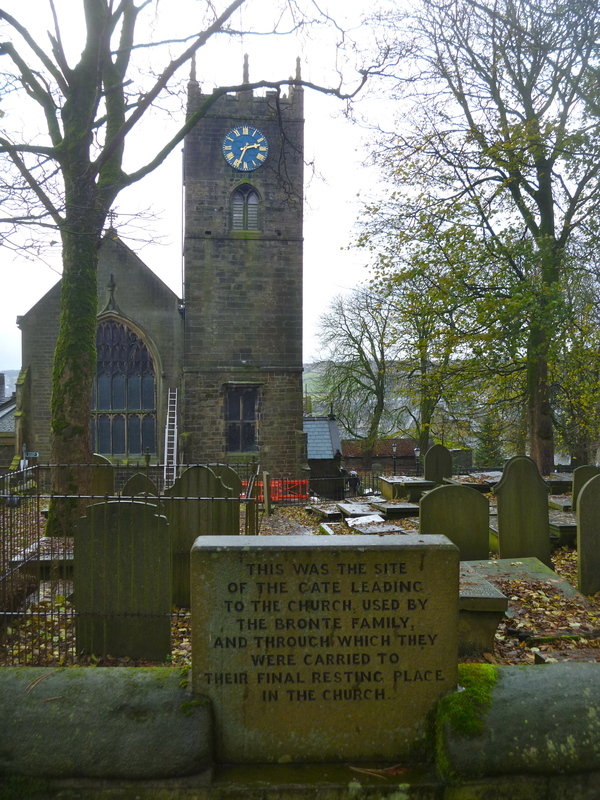 As we returned up the hill, back to the car park, we noticed that the church was open and popped quickly inside to look at the Bronte memorials before leaving the village.